Hi friends! How was your Valentine’s Day? I feel like these last few days have been quintessentially wintry in our parts — we had a serene and snowy Valentine’s Day in New York, followed by a couple of those sharp, frigidly brilliant days where everything seems pale, still, and muted by the cold. I went out on Sunday for a few forgotten errands (I always feel this compulsion to stock up on everything I think we’ll need whenever it looks like a stretch of unpleasant weather is headed our way — and then I always fail and forget something) and I thought it was surprisingly peaceful, being one of the few bundled-up folks on the quiet, frosted sidewalks, under a bright blue sky and distant but vibrant sunshine. Rimmed plates and mug: the wonderful Speck & Stone; cupcake dish and pinch dishes: The Fortynine Studio; small plates: Akiko Graham via The-Commons; oblong dish: Crate & Barrel; striped tea towel: Fog Linen. Other than the bickering, I like it. Saturday mornings are usually quiet kitchen playtime, the hours where B2 is (hopefully) playing video games and (hopefully) not working, and where I’m rummaging through our refrigerator in the hopes that I won’t be venturing outdoors. And that’s where these biscuits came in! I feel like at any given time I have at least one or two bundles of scallions going slowly limp in a produce drawer (B2 likes them over his scrambled eggs and, well, in about everything else), and ever since this scallion pie crust I’ve been mildly obsessed with working them into more than our usual applications. 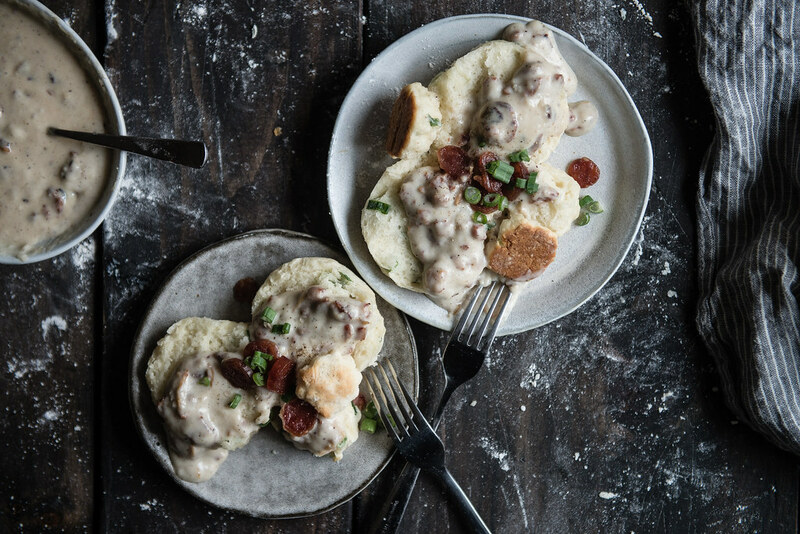 So a few snowy Saturdays ago they made their way into twist on one of my most beloved Southern breakfast staples — biscuits and gravy. The funny thing about growing up in the South but in a Chinese kitchen is that I’ve grown up eating and loving good Southern food but know woefully little about making so much of it. So I learned biscuits, not so much from a flour-dusted grandmother, but from Erika, and Beth, and Erin, and Laura — my friendly apron’ed neighbors of the blog world. 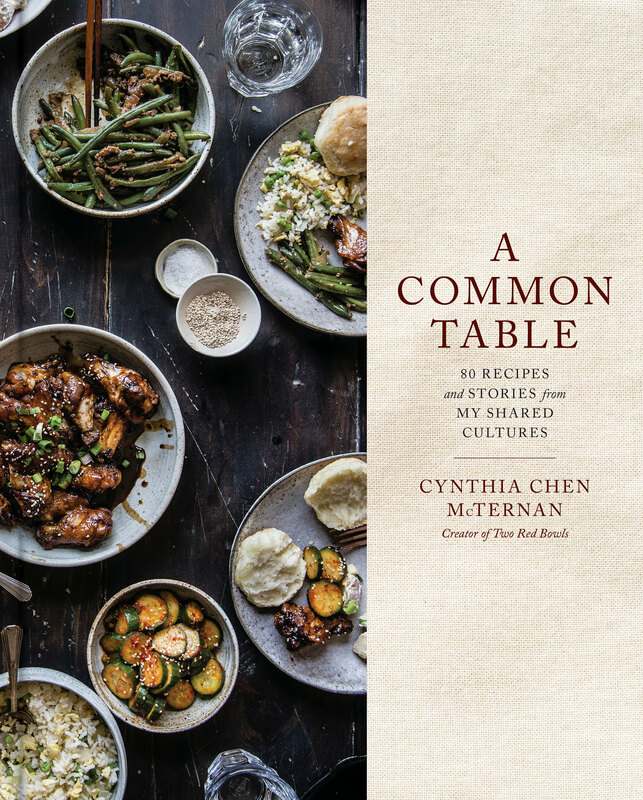 I kind of view it as a New-Age-y, modern-day take on the Southern food-as-love-as-community ideal — maybe? Anyway. 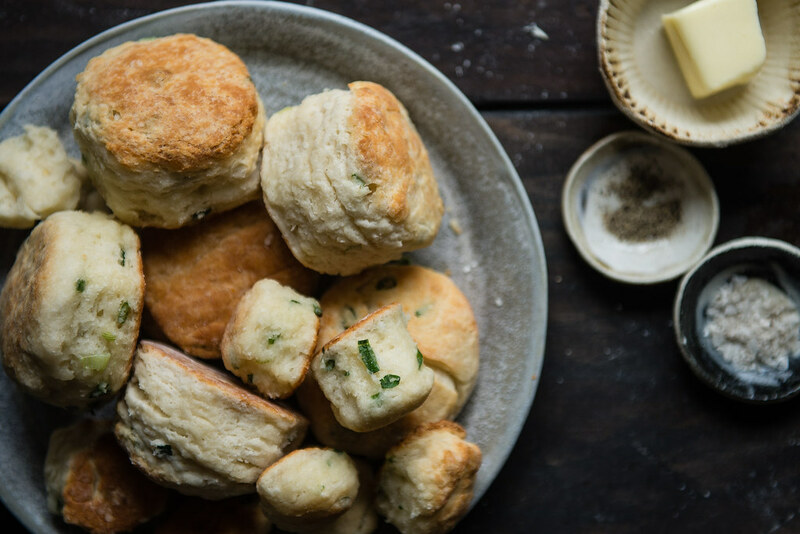 With their help, these scallion biscuits were born — light, fluffy, melt-in-your-mouth layers with a bright, occasional pop of thinly sliced scallion. Scallions, butter and flour are a magical trinity, and the mild tang of buttermilk (or yogurt, in my case) is a perfect complement to the bite from the green onions. It’s the same beauty at play in Erika’s smoked Gouda and chive biscuits, or these adorable babes that Steph made mini (as always, my idol!) or, of course, the standard cheddar-scallion biscuit. And oh my gosh, this gravy! I can’t believe it’s taken almost two years for lap cheong to crop up on this blog (well, I can, it’s because I’m too lazy to make it to Chinatown), but I recently discovered that you can order those babies off Amazon, so their glory has finally made it into my kitchen. These sweet, dried pork sausages are flavored with sugar and soy sauce (also, who knows what else) — and they are ambrosial. I used to go on fishing expeditions for them in all my mother’s dishes as a kid and mourned the day she stopped cooking with them because she thought they were too unhealthy. (They probably are.) They’re my favorite things in fried rice, sticky rice stuffing, or even just steamed right in the rice cooker with the rice. I felt a little cavalier trying them out in gravy, but it was everything I hoped — the fat renders just fine, and though the gravy turns out quite a bit sweeter than a normal Southern one, you probably know by now that sweet and savory dishes are my dream come true. With a lot of black pepper and a few of these warm biscuits, this was my dream incarnation of a childhood breakfast. P.S. In case you’re interested, you can find me in a little interview on SBS Food this week, talking about Lunar New Year and other things (a.k.a. even more about how much I love scallions). Happy LNY! Scallion biscuits with lap cheong gravy. Yield: about 8 large biscuits and accompanying sausage gravy. With help from Southern Souffle, Local Milk, Food52, and Blogging Over Thyme. This recipe was a little much for our little household of two -- it's is more suited for four or even six -- but everything is easily scaled down. I've made a half-batch of the biscuits and I've also frozen the extras, both with good results. Gravy will keep up to a week in the fridge, but I have not tried freezing it, so it may be best to make smaller batches as needed. Preheat oven to 425 degrees. 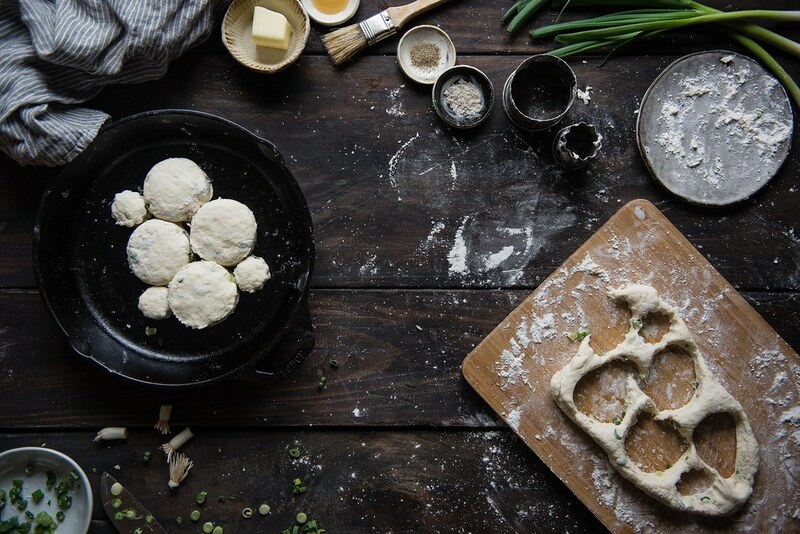 To make the biscuits: Remove butter from freezer and let thaw briefly. 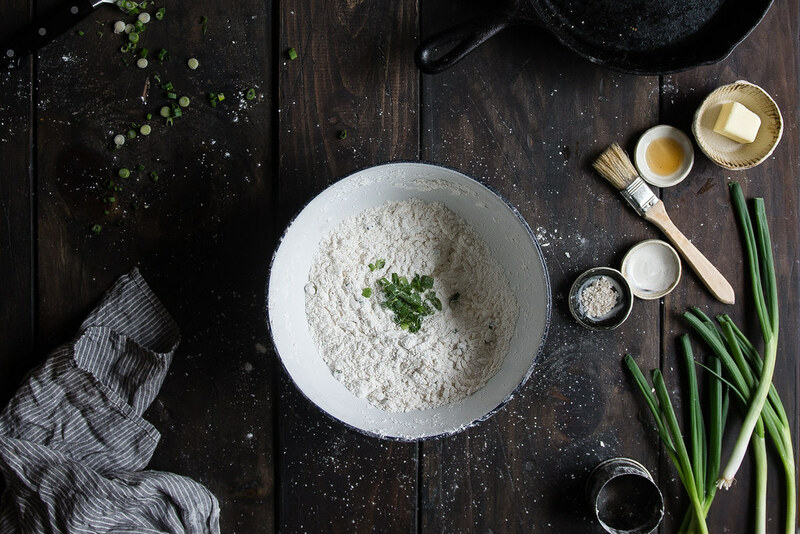 Whisk together the flour, baking powder, salt, and scallions in a large bowl. Using the largest holes on a box grater, grate the butter into the flour mixture. Use your fingers to mix the butter into the flour until all pieces are coated and no lumps larger than peas remain. In a small bowl or liquid measuring cup, whisk together Greek yogurt and milk. Pour into the flour-butter mixture and use a wooden spoon or rubber spatula to stir just until a dough comes together. 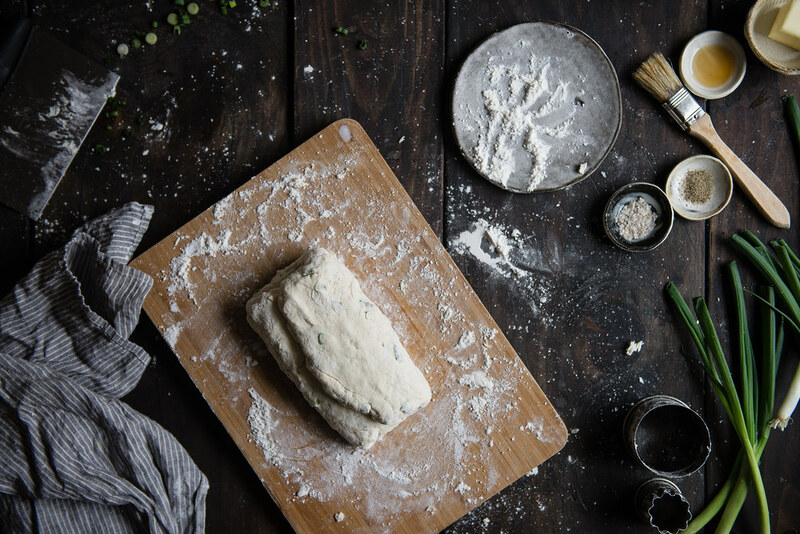 Turn the dough gently out onto a well-floured surface. Use your fingers and palms to gently pat the dough into a rectangle about the size of a piece of paper (8x11”) and 1/2-inch thick. Fold into thirds, letter-style, then use the pads of your fingers and palms to gently pat the dough to about 1/2-inch flat. Fold again and pat again. Finally, fold one more time and pat gently to a 1-inch thickness. 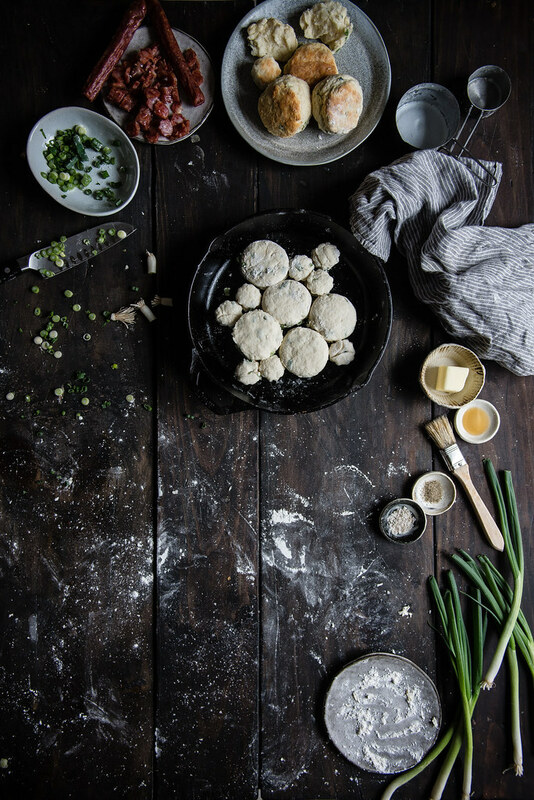 Optionally, you can scatter extra scallions across the dough every time you fold. Using a floured biscuit cutter, cut rounds from the biscuits (do not twist the cutter when you remove the rounds, which may inhibit rising). Gather the scraps and gently pile them into a 1-inch mass again, and cut again until you’ve used up all the dough. Place the rounds, sides gently touching, in a cast-iron skillet or on a baking sheet. Brush with sesame oil and bake for 12-15 minutes, or until golden-brown on top. To make the gravy: Dice the lap cheong sausage and add it to a skillet (no oil necessary) over medium-low heat. Cook, stirring occasionally, until a generous amount of fat renders and the sausage develops crisp bits. Turn the heat down to low and sprinkle the flour over the sausage, stirring continuously, until flour dissolves into the fat and forms a roux. Aim to add about as much flour as there is rendered grease in the pan, and stop adding flour before the mixture becomes a paste -- it should be thick but not dry. Continue to cook for about 2-3 minutes, or until the roux turns slightly darker. Pour the milk in a slow stream over the sausage and roux, stirring as you go, until incorporated. Continue to cook, stirring often, until gravy thickens to your desired consistency. The gravy should ideally simmer for at least 5-6 minutes after you’ve added the milk before it thickens. If it becomes too thick before that point, add another 1/4 cup milk. Season with salt and a very generous amount of black pepper (I used at least 1/2 tsp). Once the biscuits are done, split them open (or crumble into large pieces) and serve with plenty of gravy! I tried out a few variations on this biscuit recipe, all with good results. The one above is ultimately closest to Beth's gorgeous rendition. Substituting cake flour makes for a lighter, more tender biscuit, but I don't think it's truly necessary. For the "buttermilk," you can use 2/3 cup regular, unflavored yogurt and 1/3 cup milk if you don't have Greek yogurt on hand, or if you happen to have buttermilk, simply use 1 cup buttermilk. I just don't usually have buttermilk, so a yogurt and milk combination has always been my go-to. 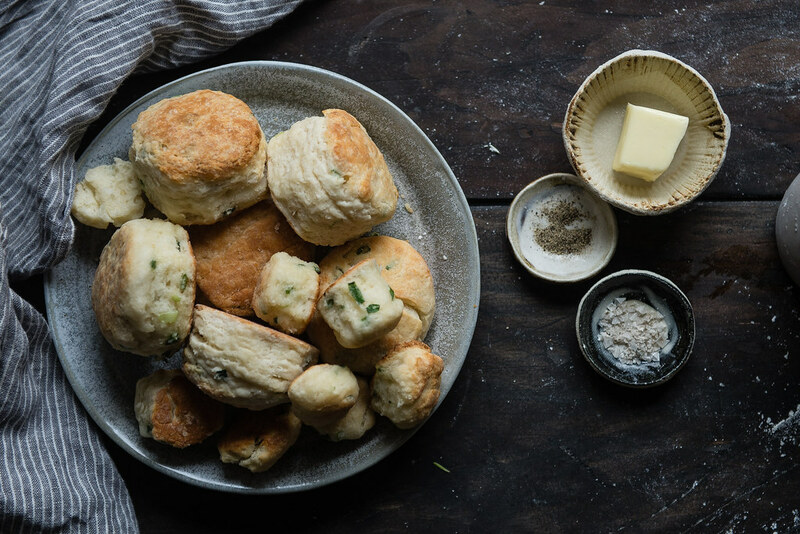 For a really revelatory, life-changing biscuit, you can up the butter content to 3/4 stick (6 tbsp) as per Erika's recipe or even 1 stick (though in that case, decrease the "buttermilk" to 3/4 cup). For a biscuit I'd be serving with a very rich gravy anyhow, I thought it was fine conserving the butter for another use, so I kept it at 1/2 stick -- but boy, that double-butter batch blew my mind, it was so good. Also, you're much better off consulting the biscuit goddesses linked above for tips on how to make your perfect fluffy, lofty, sky-high biscuits, but just a few observations from my my end -- I really, really like grating frozen butter to make biscuits (as per Laura's method) in the same way that I do for pie crust, but you can cut the butter in too. Also, you can use a rolling pin to roll the biscuit dough out if you like, but I thought patting with my fingers as per Erika's method worked just as well and gave me a tad more control. Be super, super gentle in handling the dough at all times, and they'll do just fine, even the scraps. Finally, don't be shy with the black pepper in the gravy! It's hard to over-pepper a gravy -- black pepper makes it shine. After a weekend of snow, then rain, then flooding, and finally freezing, we’re housebound. The snowbanks are taller than I am. Cars have been frozen into driveways. The entire city is like a giant slip and slide. 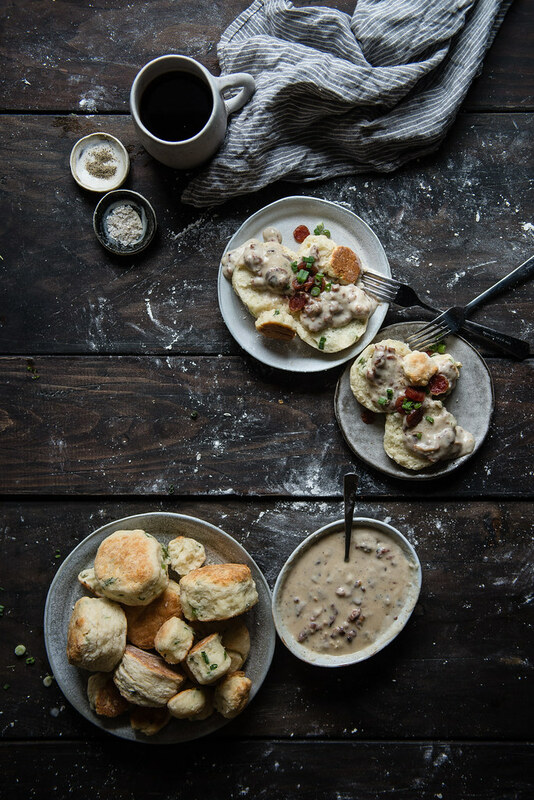 So, I will stay here, in my cozy home DREAMING OF THESE BISCUITS AND GRAVY. And sure, I could say that you’re cruel for posting them, but I won’t. I’ve gotta save my energy for ice chipping. I wish I could send you ray of sun shine from Australia! It is so warm here and I am wishing I was back in the snow again. The Lap Cheong gravy has me in stitches!!! I love when it goes all crispy from frying it it own fat goodness. I think it would be perfect topping to these! Happy Year of the Goat Cynthia. Oh my god!!!! This is literally everything I love combined into one – buttery biscuits, SCALLIONS, chinese sausages (yes, they are divine in sticky rice! ), gravy. I love the way you use the various flavors of Asia and incorporate it into something as.. er. 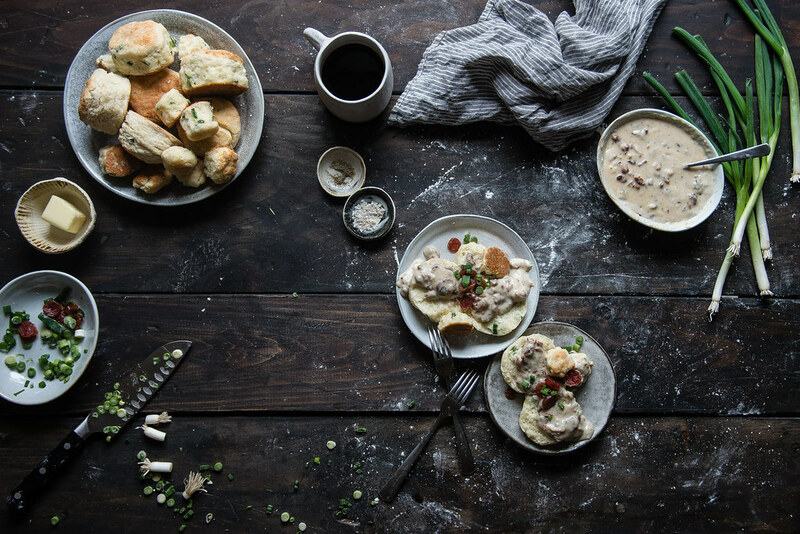 brunch-ish as biscuits and gravy! Love everything about this <3. Cindy – these towering biscuits look amazing…but I have to tell you, the lap cheong gravy is genius! : ) I loved those sweet sausages growing up and while I don’t indulge in them often enough now, I still love them and the idea of using them for gravy like this is such a neat twist. Nice mix of cultures and flavors! These biscuits are about to become the solution to my winter blues. Love that flavour friend!! OMG, these look amazing. I just drooled a little bit on my keyboard right now. What a fun fusion of flavors! aaaaaand now I’m craving biscuits and gravy! i absolutely LOVE your spin on the classic version. and dude your lately sounds exactly like my lately: cozy hermit life, eating breakfast (and dinner… and grinner) in bed, all the netflix, and hoping there’s enough food so that i don’t have to leave my spot next to the fire/range/oven. i’ve been working on my biscuit game too (except made with spelt/einkorn). so you KNOW ima be recipe testing with this whole post in mind. p.s. your styling and props = dreamy. as always. I love these biscuits, so perfectly golden and fluffy! I use the same fold method to make biscuits and I swear it makes the most fluffy and flaky biscuits ever. Love the idea of adding scallions to the mix, I am definitely trying that. I can’t believe the combos you can come up with every time! 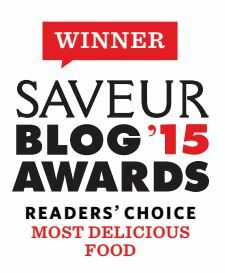 You definitely make up some of the best fusion food on the web!! And you make me miss asian stuff so much! This is too good! I marvel at how you always come up with these recipes 🙂 The wonderful thing is that my mum loves scallion scones and dad, lapcheong (we have 5 packets stowed away somewhere in the house). Happy new year! I don’t know why I am so shy about commenting on your blog. Its just so beautiful. But these biscuits have brought me out of my shell. I am such a biscuit girl and these look and sound mighty tasty. Love the addition of the scallions, too! I think you already know this, but Southern Food + Asian Flavors = my personal heaven!!! Can I jump through the screen to eat your leftovers?? No, but really, can I? Also, I just read the interview and need to say one thing: BOJANGLES. We are kindred foodie spirits, my friend. Happy Lunar year to you too. I can totally relate to your scallion obsession. And these biscuits.. Sounds and looks YUM! 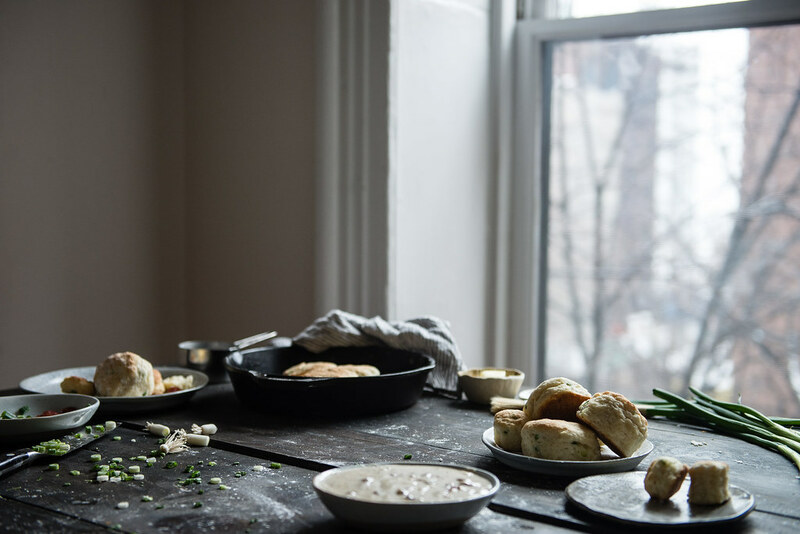 Pretty sure these biscuits are my one true love–I love how sky high they are and that gravy? You are making me weak in the knees! i have an affinity for scallions too, i like it garnished on everything except dessert. i think it leaves dw baffled. other things that confuses dw: lap xeong (i know.) and biscuits + gravy. he’s from upstate NY, the man is odd. i know. 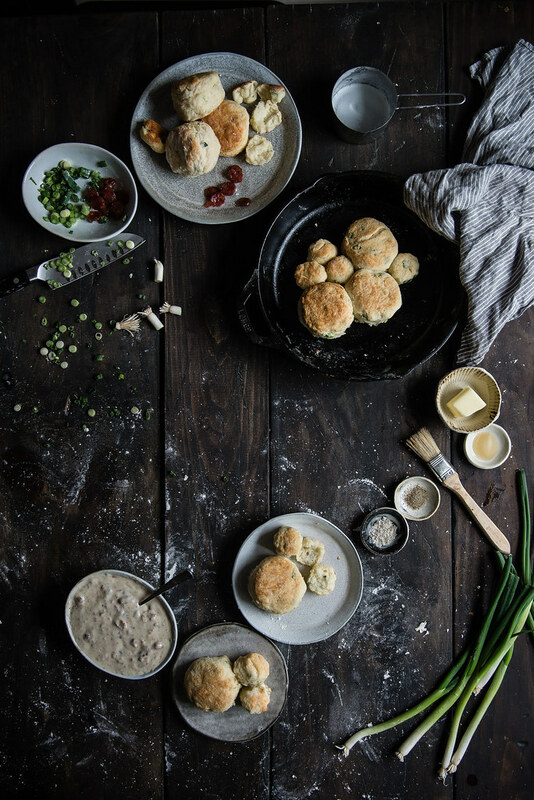 anyway, these biscuits from local milk are amazing and the addition of the scallions is delightful, something that i must do next time i’m feeling southernly. Great images. Food looks delicious! It’s always a wonder what you are going to come up with next, Cynthia! I love reading your post for so many reasons and one of them is you often write about food I know nothing about! What’s that sausage called again? I can’t remember but I know I need it! Also, same story about scallions going limp and then dry in my fridge. I usually have one in each crisper because I forget I already bought a bunch…and dill…dill always dies on me. Alice!! Oy, I’m so sorry about the link issue — I don’t know why that would be! The links are supposed to open in new tabs, so maybe it’s a pop-up issue? No idea… Technology baffles me. Sorry you had to type the URL in, that’s so annoying 🙁 but I’m glad you made it to Fog Linen!!! Oh MAN isn’t she the best?! I want to buy up literally everything she makes. And omg — spaghetti was the only Western thing my mom made, too!!! I lol’ed when I read that. It sounds like we were kindred spirits as kids, lol. Thanks so much for stopping by, lady!!! Cynthia! The biscuits look so fluffy, and that gravy.. Your flavor combinations are so inspiring!! I totally like the way you make the photos, just beautiful. And the recipe is amazing, I will have to try it. Thanks for sharing. I love how those biscuits puffed up! Lap cheong gravy…oh my. I think they serve that in heaven :p Love the Asian fusion in this recipe! I am dreading the day I have to tell my mom that my great grandpa’s niece’s son’s best friend’s twin sister’s dog-walker will not be invited to my wedding. Why does the concept of a small intimate wedding not exist in the Chinese culture?! Even as a vegetarian, this sounds mouth watering. 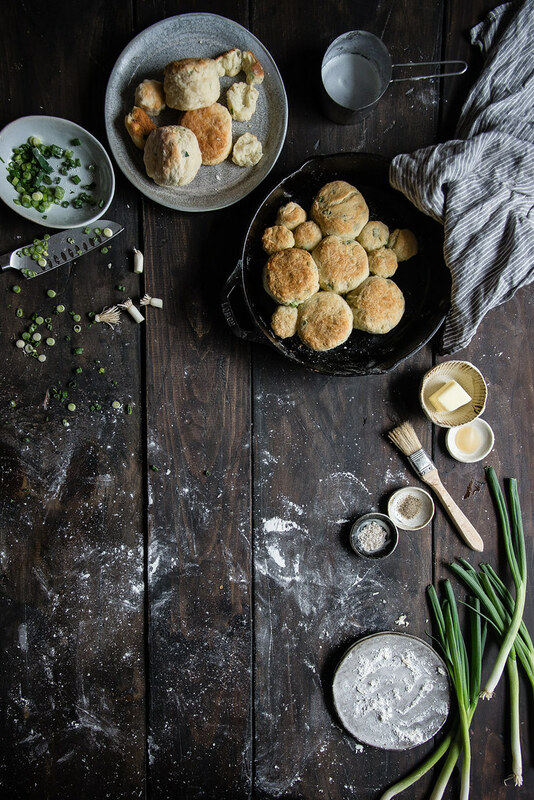 Scallions in biscuits will most definitely be in my near future. A tip for the scallions: trim off the root ends and place in a tall glass of water and keep them as you would fresh flowers! I swear they last SO much longer and never go limp or soggy on me. Amazing recipe Cynthia! That gravy really sounds to die for and the biscuits look cute. I love that weather when it’s clear, cold and quiet. 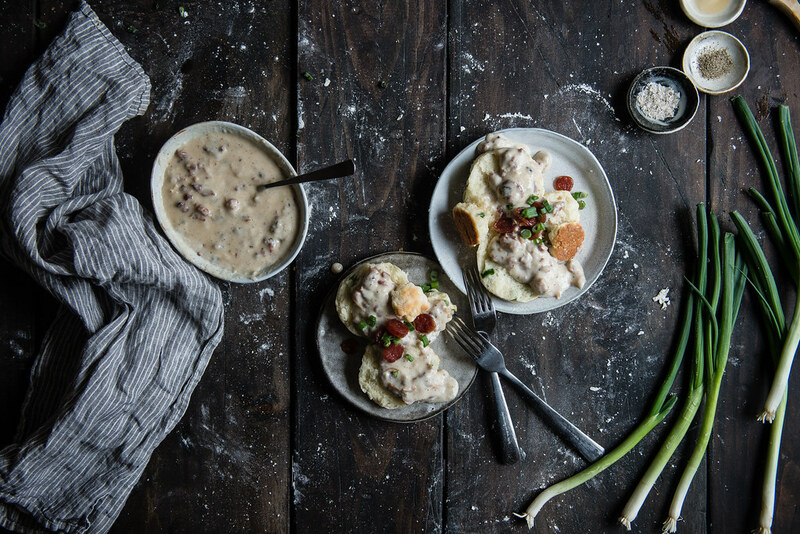 Hasn’t been a lot like that over here in Amsterdam though.. Only pouring rain..
After spending a few days in New Orleans, I have a new found love for biscuits and gravy (we were lucky to find some awesome veggie versions). This is right up my alley. That gravy looks magnificent.